amonixOur main objective for the week was the route Guy Anne, a 12 pitch TD+ with almost every pitch 6a or 6a+. 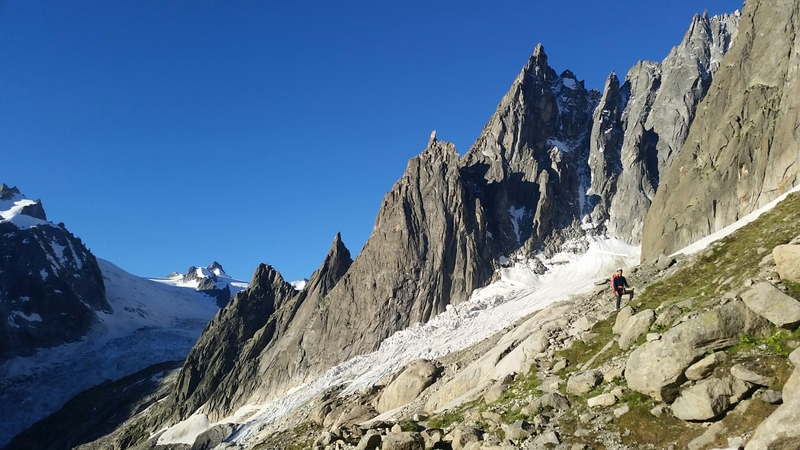 It takes the skyline of the most prominent Aiguille in the photo below. Our bivi spot looked straight onto the route – great to contemplate over the first brew of the day, waiting for the sun to warm the rock. We arrived at the foot of the route to find a team already starting the route… or so they thought. Closer inspection of the topo suggested they should have been 20m further left, so we roped up quickly and were soon on the second stance, and ahead of the other team. They’d compounded their route finding error by dropping a rock shoe into the bergschrund. They turned out to be a guide and client team who had been climbing together for 20 years. 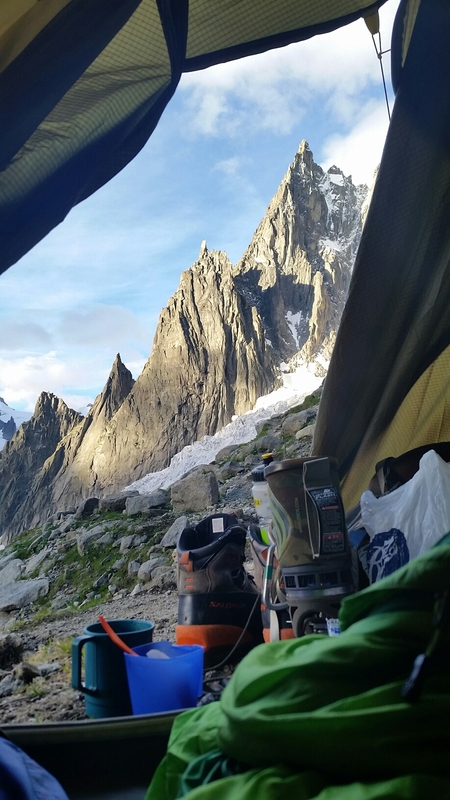 We chatted at stances as they stayed on our heels most of the way – pretty impressive with the client climbing in one rock shoe and one big boot, all be it with the occasional pull on the gear. The climbing was awesome -steady HVS to E1, pitch after pitch, with one or two E2ish pitches to spice things up a bit. We were chuffed to top out in only 4.30 hrs, and even happier to rap back down in another hour and a half without stuck ropes or any other incident. Lazy afternoon in the sun before a delicious tea of pot noodles. Who could ask for more?